Rarely does a novelist have the deep and abiding genius necessary to summon up a lost place and time with haunting memorability. Proust, Joyce… then? Even more rare is that genius who is able to conjure up a fictional character of such depth and dimension that it escapes the text, and people—even those who have not read the book—believe it is a “real” person. Cervantes’s Don Quixote, Melville’s Captain Ahab, Woolf’s Mrs. Dalloway...then? But such is the case, on both counts, with Muriel Spark’s 1961 novel The Prime of Miss Jean Brodie. Spark’s fifth novel brought an unforgettable, iconic character to the literary stage. Spark set the novel between the Great War of 1914-18 and World War II, a period corresponding to the fall of a number of Western economies and the rise of European fascism. One Friday in March 1930, Miss Brodie takes her girls on a walking tour of the Old Town district of Edinburgh, described as “a reeking network of slums” and “a misty region of crime and desperation.” The streets are smoky and dark, haunted by the cold ghosts of Calvin and his followers. There the girls come face-to-face, most of them for the first time, with the lot of so many Scots: children without shoes, a man just sitting on the icy-cold pavement, women and children clustered in chilly shadows of forbidden byways, all the while “the smell amazingly terrible.” This is a novel that “breathes life off the page” (the phrase is Edna O’Brien’s). the Buchmanites and Mussolini, the Italian Renaissance painters, the advantages to the skin of cleansing cream and witch-hazel over honest soap and water, and the word ‘menarche’; the interior decoration of the London house of the author of Winnie the Pooh had been described to them, as had the love lives of Charlotte Bronte and of Miss Brodie herself. They were aware of the existence of Einstein and the arguments of those who considered the Bible to be untrue. They knew the rudiments of astrology but not the date of the Battle of Flodden or the capital of Finland. All of the Brodie set, save one, counted on its fingers, as had Miss Brodie, with accurate results more or less. Jean Brodie is a gifted teacher of hypnotic power. One of the first lessons she teaches her girls in the autumn of 1930 takes place in the school’s garden. Ostensibly a history lesson, in reality it is a highly embellished account of her own lost lover, a casualty of battle in the Great War. She opens the lesson with a few lines from Keats’s “Ode to Autumn” before telling of Hugh: In the midst of falling leaves, one of which she catches, Miss Brodie says he “fell like an autumn leaf” on Flanders Field. The girls are reduced to tears. How much history have they learned? Will they ever forget Hugh and Flanders Field? Unlikely. Jean Brodie refused to “teach to the test,” long before it became a catchphrase. “There were legions of her kind,” women left behind when the men went into the trenches of World War I. In some ways, she is typical of women of her era. Spark’s narrator tells us that “there were legions of her kind,” women left behind when the men went into the trenches of World War I. They assumed new roles. Feisty, independent and hardworking, they charged the batteries of the war effort and made the city (and nation) function. After the war, many of these women continued to work in the realms of art, social welfare, business, government, religion and education, demanding equal footing with men. Powerful social change ensued. Such confident, emphatic declarative is fundamental to the Brodie method, and in her class—whether held in the garden or in the Old Town or in the formal classroom itself—difference reigned. She professed that education meant a “leading out” or development of what was already there, but she practiced a rigorous form of indoctrination based on on her own idiosyncratic, eccentric views, inculcating ideas and attitudes with a catechetical rigor equaled only, perhaps, by Calvin himself and the Catholic zealots of the Inquisition she so loathed. This is the Miss Brodie who was held in the “deepest suspicion” by her colleagues. They could not trust her to hold firm, since she was “still in a state of fluctuating development,” likely to change her mind, particularly about ethical questions. Her peers, it was said, had changed none of their opinions on such matters after the age of 20. Braced by solid conviction (“she let everyone know she was in no doubt, that God was on her side”), Jean Brodie held herself to be above the “common moral code,” accountable to no one. Each of the six girls selected by Miss Brodie was famous for something: for vowel sounds, for math and anger, for gymnastics, for beauty, for stupidity. When the girls enter the school in 1930, the 40-year-old Miss Brodie tells them, “You girls are my vocation; I am dedicated to you in my prime.” From them, she expects dedication in return. These girls become her confidantes, her first line of defense when she feels threatened by the headmistress. They are graced with distinction (she tells them they are “the crème de la crème”) as well as special privilege: that excursion to the Old Town, outings to art museums, the opera and ballet (seeing Pavlova’s final appearance in the United Kingdom) and tea at her flat. 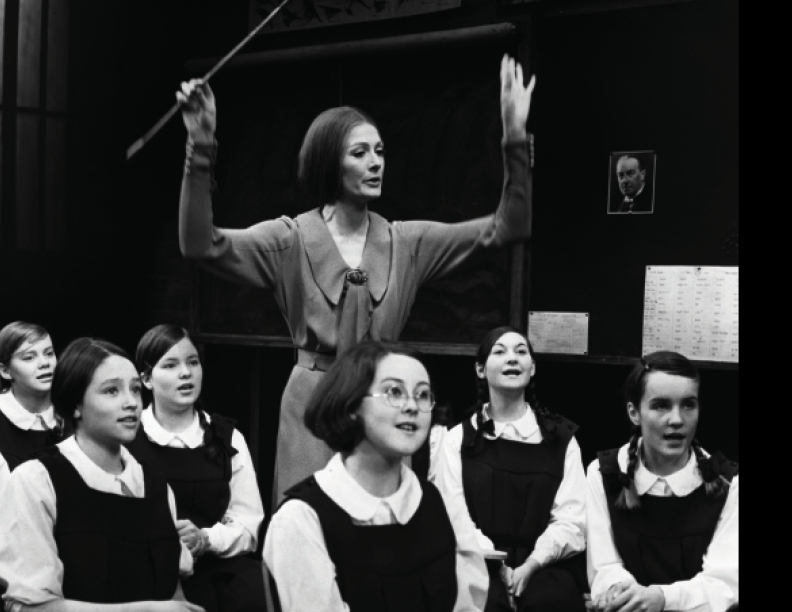 Though demanding, dictatorial and doctrinaire, Miss Brodie enchants her pupils. Yet, with the passage of time, one of the girls begins to sense something awry. Of the six in the set, only one is both famous and notorious: Sandy Stranger. Famous for her vowel sounds, she is frequently summoned to perform. One day, when Sandy is 10 years old, Miss Brodie turns to her, saying, “Well, come and recite for us, please, because it has been a tiring day”; Sandy obliges, enrapturing both teacher and classmates with a passage from “The Lady of Shallot.” In addition, she is notorious for “her tiny eyes, which it is astonishing that anyone could trust.” References to those eyes, variously described as “tiny,” or “little,” or “pig-like,” proliferate. She is a strange little girl, this Sandy, who is also the perceiving consciousness of the novel, a fact to which we are alerted in the novel’s first five pages. She will begin to become suspicious of Miss Brodie’s will-to-power on that Old Town walk, intuiting that her teacher has made herself the head of a body, with the girls themselves mere limbs created to fulfill Miss Brodie’s destiny. Over the course of the novel, Sandy’s perceptions become more and more acute. Everything remains theoretical, however, until Sandy realizes that the scenario Jean Brodie envisions for one girl, Rose, to sleep with the art master who is the object of Miss Brodie’s passion, is to be put into practice. Sandy resolutely foils the plot, having a short, summertime affair herself with the man. Jean Brodie is forced to retire, on grounds of teaching fascism, at the end of the summer term of 1939. Unable to get the evidence necessary to turn Miss Brodie in on charges of an affair she is having with the music master, Sandy will not be thwarted. She seizes the moment when Miss Brodie dispatches one girl, not a member of the Brodie set, off to the Spanish Civil War (to fight for Franco!). Miss Brodie’s avowed enthusiasm for Mussolini (“Mussolini is one of the greatest men in the world,” she tells her students), and Hitler extended to Franco as well. Joyce Emily Hammond dies en route when her train explodes from an attack. Jean Brodie is forced to retire, on grounds of teaching fascism, at the end of the summer term of 1939. Five years later, at the age of 56, she dies of a “wasting disease,” whining, “I wonder who it was betrayed me,” her once-powerful, carefully-inflected and resonant voice reduced to a pitiful, repeated plaint. Five of the girls look back fondly on their time with Jean Brodie. One returns years later during the Edinburgh Festival to put flowers on Miss Brodie’s grave, telling her husband that Jean Brodie was “an Edinburgh Festival all on her own.” Another, the pitiful Mary McGregor, famous for being stupid and the target of Miss Brodie’s withering sarcasm, just before her death (age 23) in a hotel fire, looks back to her days with Jean Brodie as the happiest of her life. But Sandy is the exception. For her, the years with Jean Brodie had been disturbing, even alarming, once she had perceived Miss Brodie’s sense of herself as Providence. Sandy came to understand that during her time with Jean Brodie she had had a vision of hell. Only years later, having become a Roman Catholic, then a cloistered nun with the name “Sister Helena of the Transfiguration,” did her perspective and perception shift: “It was twenty-five years before Sandy had so far recovered from a creeping vision of disorder that she could look back and recognize that Miss Brodie’s defective sense of self-criticism had not been without its beneficent and enlarging effects.” Unlike one of the other girls, Rose, who “shook off Miss Brodie’s influence as a dog shakes pond-water from its coat,” Sandy remains haunted by the specter of Jean Brodie. In the end, we are left with three plotmakers: Jean Brodie, Sandy Stranger and Muriel Spark—or maybe four. Jean Brodie is a woman of considerable gifts, a plot maker who ultimately fails. Lacking omniscience and omnipotence, she cannot bring to fulfillment her grand designs. She is a woman of “completely unrealized potentialities,” according to her creator, but seriously, indeed tragically, flawed nonetheless and consumed by a “wasting disease” as much spiritual as it is corporal. Sandy Stranger is a plotmaker, too, right from the start. As a young girl she is given to elaborate fantasies scripting herself into scenes with the likes of Alan Breck from Stevenson’s Kidnapped, Mr. Rochester from Bronte’s Jane Eyre and Anna Pavlova, the great Russian ballerina. With the assistance of another girl from the Set, Jenny, she writes an original fantasy focusing on Miss Brodie’s affair with Gordon Lowther, the music master. When the two girls have finished the text, they hide it away in a cave, and we may be meant to think that Sandy has abandoned plotmaking and fantasy. Her later foiling of Jean Brodie’s surrogate-lover plot might seem to bear that out. While it is not possible to discern motivation for conversion and taking the veil, one might wonder if that, too, might not be just another escapist fantasy in which Sister Helena of the Transfiguration now finds herself trapped? Perhaps Sandy has become another Miss Brodie with a set all her own? Perhaps that is why she clutches so desperately at the bars of her grille when Jean Brodie’s name is mentioned? Perhaps she and Jean Brodie are sisters of a sort, more alike than Sister would like? But it is a different story for Muriel Spark the plotmaker, always in complete control of both character and plot. We hear her voice in that of a character in her last novel, The Finishing School (2004), who, when asked if his characters ever take over, replied, “No, they do not. They lead the life I give them.” It is only the novelist herself who exercises complete control: No one will foil her plot. For Spark, who converted to Roman Catholicism in 1952 at the age of 34 and cherished the fundamentals of her faith, there is always another plotmaker: the ultimate plotmaker whom the novelist merely imitates. So when the narrator of The Prime of Miss Jean Brodie asserts, “there was a mystery here to be worked out,” it has nothing to do with why the art master invites the Brodie Set to his studio (the immediate context of the assertion), nothing to do with why Jean Brodie or Sandy Stranger do what they do (more than once Spark declared, “I don’t go in much for motives, I never have”). It has, rather, to do with why human beings fail to recognize that life is not fiction, that ultimately plot is beyond our control and always will be, world without end. Amen. My exposure to Miss Brody was in the film and I was left with the picture of her as a corrupter of youth who, using the power of the office of teacher, by the end of the film had created an acolyte, a clone, of her own ugly self. If the book and the play really contained this picture, it is a timely event to take it to the stage. American education appears to have gone so far down the road that it may be a wake-up call to protect your children from the contemporary plague of teachers who are indoctrinating them into the spectrum of chaos called cultural Marxism with Feminism, Multiculturalism, Gender Studies, Political correctness and Critical Theory. This article also appeared in print, under the headline "The Teachable Moments of Muriel Spark," in the Spring Literary Review 2018 issue. Robert E. Hosmer Jr. is an English professor at Smith College in Massachusetts.